When I first spoke with Pat Hagan about his plans for the Craft House on Frankfort Avenue, he and fellow owner Brad Culver mused that they would like to see the name develop organically into “Crescent Hill Craft House,” as they likely would open other locations down the road. It did, and in summer of 2016, they are. But whereas the original Craft House was set in a space marked with memory and featuring beautiful exposed brick with arches, the forthcoming Germantown Craft House will be located at 1030 Goss Ave. in a building that heretofore has housed offices. In other words, it’s not already a comfortable space for a bar and restaurant, which was the case when neighborhood favorite Dark Star began its transformation. Which is to say the ownership group isn’t going to replicate what it did in Crescent Hill, but rather will create a sibling that bears a resemblance but isn’t a twin. As such, the 4,500-square-foot building, which the owners are buying from Underhill Associates, will be completely re-imagined and re-designed, with help from Architectural Artisans. The Germantown Craft House will feature a 1,000-square-foot outdoor deck facing Goss, along with an A-frame glass facade that will, indeed, make it different than its sister establishment. Inside, Kerley says, wood salvaged from the forthcoming Underhill-owned Germantown Mill Lofts will help bring about that feeling of comfort from floor to ceiling. Kerley and Hagan declined to reveal their investment, but a complete overhaul, they admit, isn’t cheap. Still, located just across from The Post and Four Pegs, the Germantown Craft House will give Louisvillians yet one more reason to venture into that area of town (as if they need more), giving the owners confidence that it will not just succeed but become a staple of the neighborhood. The new Craft House likely will feature 50 taps instead of 40, pouring all local and regional beer, along with signature craft cocktails, a brunch menu and iced coffee drinks. “It’s still going to be food-oriented,” Hagan said, “but it will probably be more of a bar” than the Crescent Hill version. And by that, he means that sausages made on-site will be available, along with liverwurst and other traditional German favorites. Kerley confirms that the more popular dishes on the Crescent Hill menu will make their way to the Germantown version, and the food will still be sourced locally as much as possible. Permits and planning are under way, but few details are set in stone. After the new Craft House opens, Hagan and his crew will set their sights on a new Blugrass Brewing Company location on Fourth Street, which is planned for fall of 2017. David Pierce has a black, three-ringed binder he’s been carrying around for two decades, give or take. On either side is a graphic of the labels from Hell For Certain and mead, beers he’d brewed for Bluegrass Brewing Company back in the 1990s and 2000s. But inside is what matters: That’s where the recipes are stored for all the beers he’s created over the years, written by hand on green paper. Well, at least all the good ones are. He recalls brewing at BBC with the late Matt Gould in the early days of BBC. Pierce dug back into the binder following his return to the brewery this past summer and is rolling out some old recipes to help celebrate the brewery’s 22nd anniversary this Saturday, Nov. 7, including a fundraiser for My Dog Eats First and a “Halfway to Derby City Brewfest” party. Five BBC classics, or at least versions of them, either have been tapped or will be tapped by Saturday, including SOB ESB, Barleywine, Ebenezer, Old St. Matt Ale and longtime favorite Hell For Certain. Asked why he plucked those out of the binder, Pierce says it was basically by request from the brewery’s regulars. Hell For Certain is already on draft and is once again a hit. The slightly lighter version than in the past is a malt-forward and lightly bitter ale that checks in at 6.5 percent ABV. Its signature fruit notes come from one of Pierce’s longtime favorite Belgian yeasts, called Chouffe. “I taste that yeast, and I’m transported back to Belgian in the mid-’90s,” he says. Of course, he and owner Pat Hagan also discussed what beers sold well previously, and that entered into the decisions. Pierce had hoped to brew a batch of the Anniversary Nut Brown Ale, but it was determined that customers had lost interest in it by the end of its run. The Old St. Matt is an English strong ale that is a high-gravity, seasonal beer, while the SOB ESB is a classic English bitter that came out moderately hopped at about 50 IBU (early batches ranged from 35 to near 60, so it’s in the sweet spot). Pierce estimates that the half-batches he made of most of the classic beers should last a couple of weeks; the ESB was a full batch and should last longer, he says. An upgraded brewing system will help him continue to crank out new and old recipes. Fortunately, one key thing about BBC has never changed. “One of the things about working here back in the old days was, as long as we have the core beers in place, it was pretty open” in terms of brewing experimental and seasonal beers. Look for Pierce to continue the tradition of trying new things. The anniversary celebration on Saturday gets started at 11 a.m. with family- (and dog-) friendly activities as part of the My Dog Easts First fundraiser. A silent auction, a bounce house, Comfy Cow ice cream and a number of booths featuring local animal charities and services — including Rudy Greens, Derby City Mobile Vet Clinic, Tyson’s Chance, Louisville Metro Animal Services, Arrow Fund, Kentuckiana Pug Rescue, Hand in Paw, Cali Choo Furniture and many others — will keep attendees busy. There also will be adoptable pets on site. Buy an Altbier — one of BBC’s core favorites — between 3-6 p.m., and the money goes directly to the charity; My Dog Eats First provides free pet food, supplies, vaccinations and spay/neuter services for the pets of the under-served and homeless within the local community. Beginning at 6 p.m., the “Halfway to Derby City Brewfest” party begins, with live music, bourbon and plenty of beer. Whiskey Bent Valley Boys kick off the music, followed by the Uncommon Houseflies at 8:30 and Audio Addiction at 10. David Pierce. Photo by Rick Evans. 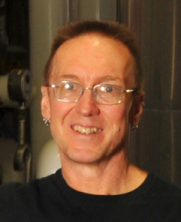 David Pierce, Louisville’s senior commercial brewer, confirmed he has returned to Bluegrass Brewing Company, the brewery where he worked from 1993-2009, after six-plus years at New Albanian Brewing Company in Southern Indiana. During those six years, Pierce worked with New Albanian co-owner Roger Baylor, another mainstay in the Louisville beer scene; recently, Baylor announced he was selling his stake in the Indiana brewery. Meanwhile, Pierce started back to work at BBC this week, but he will continue to help New Albanian owners Kate Lewison and Amy Baylor during the transition as they continue to learn about brewing and distribution. He said his reason for returning to the brewery where he helped to make Louisville a brewing city again has less to do with Roger Baylor leaving and more to do with timing and simply wanting to come back home. “I live 2 miles that way,” said the Clifton resident, pointing down Shelbyville Road toward Frankfort Avenue. He said when the group that owned the BBC production brewery re-branded that brewery to become Goodwood Brewing Company, he began talking to BBC owner Pat Hagan about possible collaborations as a way to help boost interest in BBC. Since the re-branding took place, Hagan and Chef Sean Haggerty have launched a line of retail food products. Pierce said he and Hagan discussed bringing back some of the original beer recipes Pierce had brewed at BBC in the 1990s when the brewery was still young as a way to re-ignite interest. That led to them talking about a reunion, and he agreed to make the change. “It’s a homecoming kind of thing,” he said. Pierce had worked as the original brewer at the short-lived Silo Brewpub before teaming up with Hagan to open BBC in 1993. He helped brand the business and worked there as head brewer until 2009, when he joined New Albanian. During his time at BBC, he brewed staples such as the Dark Star Porter, Altbier, American Pale Ale, Nut Brown Ale and others, and variations of many of his beers remain on the menu today. Roger Baylor noted that his opportunity to work with Pierce at New Albanian was somewhat of a bucket list fulfillment. Meanwhile, Josh Hill will take over brewing duties at New Albanian, where he previously worked; Hill left NABC to take a job with the yet-to-open Floyd County Brewing Company, and then returned after that venture didn’t pan out. The future of New Albanian brewing, at this point, will depend on what Lewison and Amy Baylor decide to do in terms of how much they want to focus on brewing versus the restaurant businesses. They previously had said the plan is to keep both the Bank Street Brewhouse brewing operation and the brewhouse at the New Albanian pizzeria. When the Bluegrass Brewing Company production brewery on East Main Street rebranded to Goodwood Brewing back in May, the longtime Louisville beer brand suddenly found itself no longer on retail shelves or on local guest taps. Owner Pat Hagan said it would likely be months before bottling production would resume. 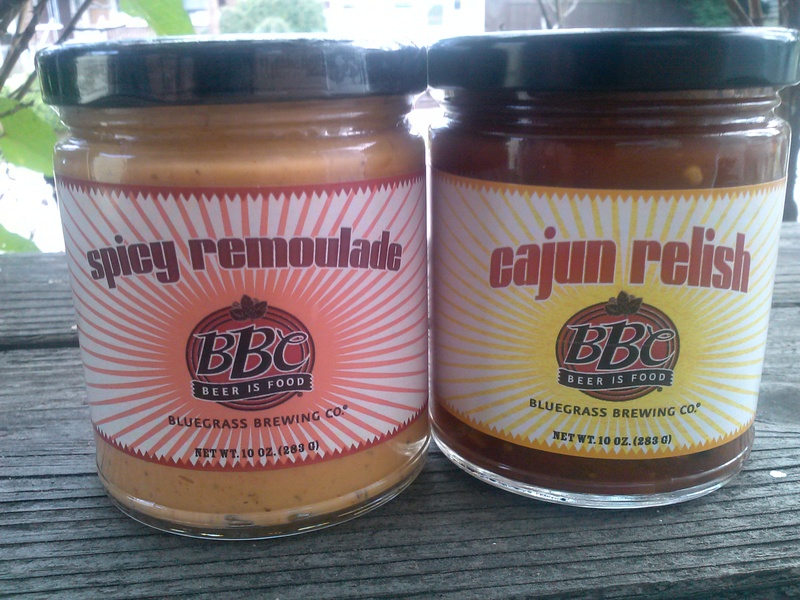 The four products include BBC Premium Porter Mary Bloody Mary Mix, BBC Beer Cheese (which has long been available for dine-in at the brewpubs), BBC Cajun Relish, and BBC Spicy Remoulade. Developed by Hagan and catering chef Sean Haggerty, the products not only contain (or pair well with) BBC beer, they focus as much as possible on other local ingredients. 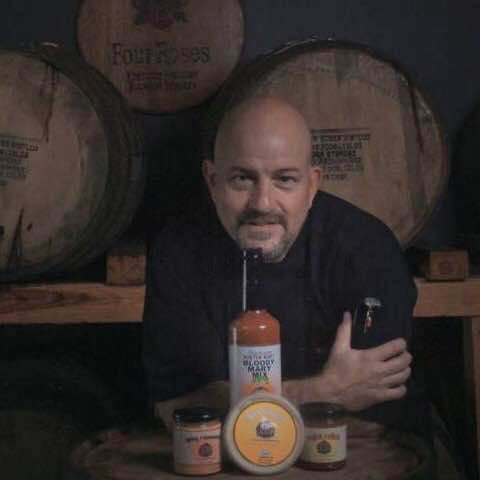 The products are being produced for retail by Pop’s Pepper Patch, a Louisville food manufacturer, while one of the distributors is Fish Marker Inc. I stopped by the BBC location in St. Matthews for a taste of all four products, and they were happy to oblige. 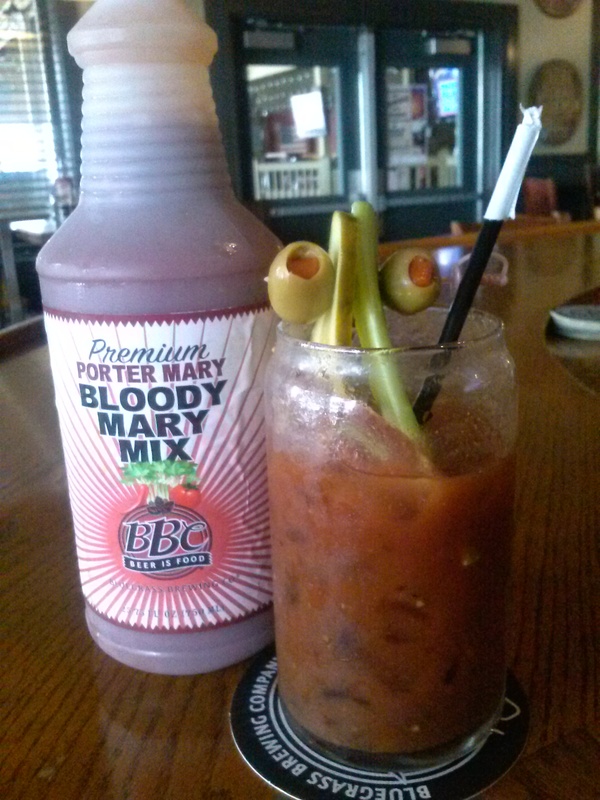 It was lunchtime when I arrived, and I didn’t necessarily want to drink vodka, so I asked the bartender if he would make me a virgin bloody mary with the new house mix, and he gladly obliged. He added the usual suspects, such as hot sauce and Worcestershire, plus olives, a pickle slice and celery, but left the mix front and center. It’s an interesting and unique concoction, to be sure, smoky and lightly spiced, with just a hint of the BBC Dark Star Porter in the flavor profile. Most importantly, it’s miles away from the generic mixes that seem to be just glorified tomato juice. Mixed with the other ingredients, it showed fantastic potential and is fairly priced at $7 for a 750ml bottle (you have to buy your own vodka, of course). “It will have a bit more kick with vodka in it,” the bartender said. I would imagine so. The good news is that the flavor is bold enough not to fall away in the face of ice and other ingredients. If you’re drinking a bloody mary that looks pink, you’re probably using the wrong mix (or putting in too much vodka — but that’s up to you). Haggerty even said it is great when used for sauce, which doesn’t surprise me a bit. The beer cheese is made with BBC’s Altbier with an unspecified processed cheese and “local spices” — mustard powder, aged peppers and garlic powder are all listed, but it’s impossible to tell what’s local — and packaged in a 12-ounce plastic container for $6. The bad news is the seal was really hard to open (thank goodness I found a screwdriver); the good news is the beer cheese compares favorably to what is served in the brewpubs. It’s thick and tangy, slightly sharp, with only mild spices. The peppers and garlic do take a step forward after a few bites, however. It’s a solid beer cheese that goes great with the house-made potato chips. The fact that I had a hard time stopping even though I’d already had lunch was telling. The relish and remoulade will be available soon, according to BBC marketing director Kathy Ogburn, but the product testing has gone well. But it’s the two sauces Haggerty was especially happy to see hit the market. He had released the relish roughly eight years ago, around the time Big Dave’s was a staple in the Highlands, selling out 40 cases in six weeks. A deal to get that and the remoulade into Kroger fell through at the last minute, and the sauces have been in limbo ever since. He signed on with BBC a few years ago and brought the idea to Hagan, who jumped on board. For Haggerty, it represents the culmination to a lot of hard work. Meanwhile, the BBC Spicy Remoulade is a mayo-based aioli made with roasted red bell pepper and garlic puree, adding basil and other spices to form a spread that pops with onion and garlic, and adds a subtle cayenne heat to the mix. This would be a great sub for bland mayo on pretty much any kind of sandwich. For BBC, it’s a great boost at a time when the Theater Square location has closed and beer distribution is back to the drawing board. The products will be available at BBC brewpubs, Liquor Barn, Diamond Pub and Billiards, Theater Square Marketplace, Dragon King’s Daughter, and Barret Avenue Liquors, with more expected in the coming weeks. They will also be available for order online. 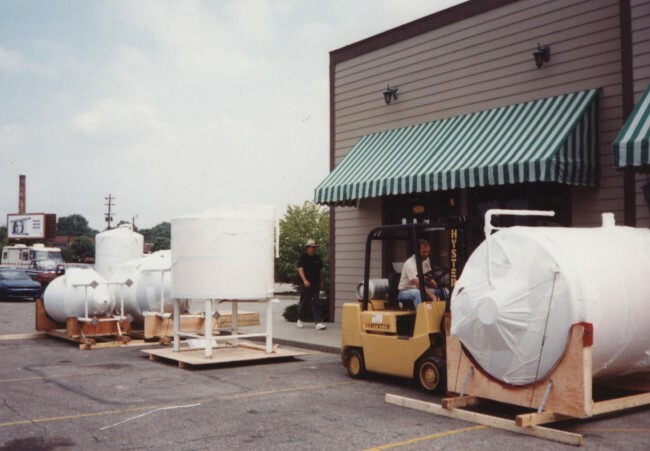 Moving in the brewing equipment, circa 1993. Photo courtesy of David Pierce. Bluegrass Brewing Company in St. Matthews turns 21 on Saturday, Nov. 1, and that night the brewpub is going to party like it’s 1993. The best part is, with BBC turning 21, it is now old enough to drink one of its own beers. Or something like that. What it means for everyone else is that pint prices will roll back to opening day at just $2.25 a pint all day. In addition, BBC will release its Anniversary Ale, based on the brewery’s longtime staple Nut Brown Ale. In addition, a number of menu items from the past will return for a day, including Shark Bites, Jamaica Jerk Pork Brioche, Apple Pizza and possibly even the Jalapeno Poppers. There will also be plenty of memorabilia from the past, including old photos, menus, coasters and newsletters. 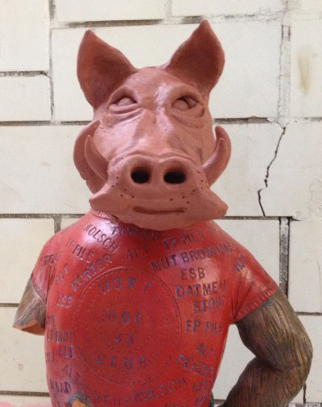 Perhaps the most surprising appearance will be made by the original Wort Hog statue — which, of course, was the original mascot of sorts for BBC’s Wort Hog Club. The Wort Hog character has long appeared on glasses and T-shirts for members who get special discounts on beer, food and events. The statue has been out of commission for many years but is being partially restored by Wort Hog Wayne Ferguson. There will also be a name-the-beer contest, which is another throwback BBC staple; one such contest took place 14 years ago and was won by Alex Baird, original Wort Hog No. 128. There’s a good chance Baird will be there on Saturday, sipping from his official Wort Hog mug. The day caps off with music by the Allmanacs, an Allman Brothers tribute band. A $5 cover begins at 9 p.m. 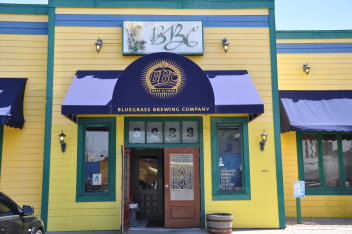 When Bluegrass Brewing Company opened, only 300 microbreweries and brewpubs existed in the United States; today there are more than 2,800, and that number is growing. That BBC is the torch-bearer for Louisville is significant — it has maintained its stability and popularity for more than two decades despite a changing brewing landscape. The loyal customers and Wort Hogs are a big part of that; it has achieved an almost Cheers-like persona, maintaining its familiar atmosphere while St. Matthews has changed so drastically around it. When BBC opened, it was flanked by Bacon’s furniture store, Plehn’s Bakery, Dutch’s Tavern, BW3 and Maier’s Tavern; today, there’s Mellow Mushroom, Molly Malone’s and The Tin Roof. Regardless of change, expect to see plenty of familiar Wort Hog faces from the past, including Baird and Ferguson, on Saturday. Your grandfather drank Falls City, Fehr’s or Oertel’s ’92 beer back in the 1950s and ’60s. Those were lager-style beers brewed right here in the River City. 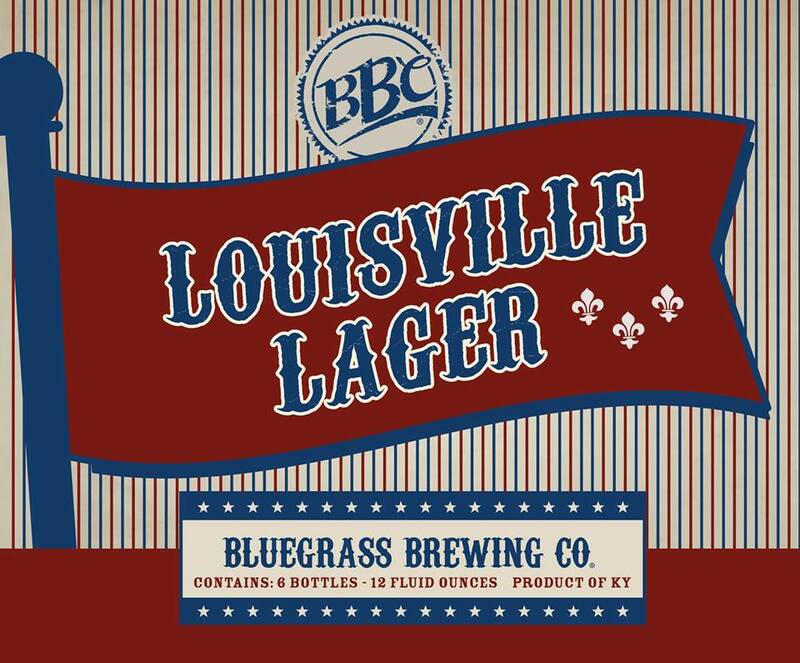 Locally brewed lager returns Aug. 20 when Bluegrass Brewing Company Taproom unveils Louisville Lager, a beer the company’s principals believe will reach out to a larger audience than many craft beers on the market. The reasoning? In spite of the growth of craft-brewed beer popularity, BBC president Phillip Dearner says, the vast majority of people are still drinking “yellow beer.” As such, brewmaster and vice president of operations Joel Halbleib concocted a crisp, malty, lightly hopped and ever-so-slightly sweet lager to basically show people that craft beer can be accessible to almost all palates. I got to try a few unfiltered and un-carbonated ounces of Louisville Lager, and it sure tastes like something people will get behind. It’s a beer by which a Bud Light drinker won’t be scared off, but it also has a distinctive malt character and just the tiniest hop bite on the finish. Another interesting point about the beer is that it is branded quite differently than most BBC beers, which bear the familiar (to Louisvillians, at least) BBC script, sunburst and hop logo. Louisville Lager bears an eye-popping red, white and blue logo that hints at vintage. Frankly, it simply looks all-American. What Dearner said he wanted to avoid, somewhat ironically, was the familiarity to people who have tried more flavor-intense BBC beers and did not enjoy them. The approach is similar to how Sam Adams has marketed its Rebel IPA, distancing it from the parent brand intentionally. “BBC has been around 21 years now and that sunburst that’s on all of our packaging, that sends the message to most people that, ‘This is a Louisville craft beer,’” Dearner says. But if they’ve had BBC Stout or APA, well, they may be expecting anything but a crisp, drinkable lager. When Halbleib first began developing a recipe, he focused on creating a Vienna-style lager. Dearner was quick to warn that the minute an exact style was identified, the beer snobs would begin nitpicking. So Halbleib changed course and ended with a lager that features aspects of both Vienna and Munich lagers, but which technically is neither. It is its own thing. As for introducing it to beer drinkers, it’s a pretty simple approach. It speaks specifically to the folks who don’t believe they like ales or, god forbid, “dark” beers. But the truth is that baby boomers were weaned on yellow beer. “I think the guy who is 50 and above who has drunk nothing but lagers feel so safe with that style,” Halbleib says. But what it boils down to is that when Louisville was a big brewing city, there were two styles the city’s beer drinkers quaffed most often: Kentucky Common, a dark cream beer, and lager. The reason for this is because of the influx of German immigrants in the mid-1800s; they found Louisville to be an ideal place to start a new life, and they also found the climate and resources ripe for brewing. Lager is decidedly German, and as such, it became extremely Louisvillian as well. Louisville Lager, in a way, pays tribute to Louisville’s history, adding another aspect of the beer both Dearer and Halbleib believe will help sell it. You can’t get Oertel’s ’92 at the liquor story anymore, but Louisville Lager will be there for the asking. Interestingly, one reason local brewers don’t make lagers more regularly is that it takes twice as long to ferment. With most local breweries having limited production capacities, making a lager becomes a more difficult proposition than making an ale. BBC’s production facility expanded about a year ago, adding three new fermenters, and brews about 14,000 barrels annually. But another reason many avoid lager brewing is that it’s simply not easy. “You’ve got to baby it,” Dearer adds. Halbleib says he went through three or four batches before green-lighting the final recipe. But he feels it’s just right. Armed with tap handles made from rejected Louisville Slugger bats (you can’t get much more local than that) and the splashy new branding, Louisville Lager will begin popping up all over town later this month beginning with kick-off events Aug. 20 at the BBC Taproom, 636 E. Main Street; Thursday, Aug. 21, at Mellow Mushroom and Molly Malone’s in St. Matthews; and Friday, Aug. 22, at Drake’s at the Paddock and St. Matthews, and Highland Tap Room. Price points will be $8.49 for a six-pack and roughly $4 to $4.50 per pint, depending on the location. Dearer feels it will soon be a Louisville mainstay, and will be available not just in craft beer locations but even places like Applebee’s or O’Charlie’s. Heck, your grandfather may even give it a try. 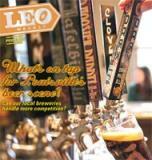 What’s on tap for Louisville’s beer scene? Matt Fuller, Vince Cain and Zach Barnes are working their butts off these days. On a recent Saturday afternoon, Fuller and Cain, along with a couple other helpers, were busy building out a 3,000-square-foot space in the Highlands in preparation for opening Great Flood Brewing, their new craft brewery. They were hoisting a roof piece they’d put together themselves onto what will soon be a walk-in cooler where precious kegs of their beer will be tapped. And even though the space, which is just a few doors down from Twig and Leaf, looked like so many piles of lumber mixed with a few ladders on that Saturday, they remain confident they’ll be open sometime in late February. Such work is going on all around town. Red Yeti Brewing is building out a space in downtown Jeffersonville and hopes to open by late January; another local brewer, Cory Riley, is eyeing April 1 as an opening date for his Bannerman Brewing in the Clifton area. And Beer Engine, based in Danville, Ky., has been working furiously to open a location in Germantown. In addition, five more breweries are planning to open in 2014 in and around the area. Add those to six established local breweries and brew pubs — Bluegrass Brewing Company, Cumberland Brews, New Albanian Brewing Company, Falls City Beer, Apocalypse Brew Works and Against the Grain Brewery — and the supply of local craft beer is about to more than double. And that doesn’t even include Gordon Biersch and BJ’s Restaurant and Brewhouse, two chain breweries with locations in Louisville. Nor does that include craft beer destinations such as Sergio’s World Beers, Louisville Beer Store, Buckhead Mountain Grill, Tony Boombozz Tap Room and plenty of others that offer craft brews from around the region and the world. So how much craft beer can Louisville consume? Sure, there are a lot of hipsters here, but even they spend a ton of their drinking money on PBR. How will a new brewery survive? In talking to a few of them, they express varying levels of confidence. The national Brewers Association reports that there are just fewer than 2,500 craft breweries — which are defined in part as having an annual production of 6 million barrels of beer or less — currently operating in the United States. But consider this: There are another 1,500 or so lined up and preparing to begin operations. So, Louisville is not an exception. In fact, Louisville is outpacing the overall trend. The good news is that growth of the craft-brewing industry in 2012 was 15 percent by volume and 17 percent by retail dollars; 13.2 million barrels of craft beer got brewed in 2012, compared with just fewer than 11.5 million in 2011. Craft beer now represents 10.2 percent of the domestic beer market, according to a recent story by Business Insider; meanwhile, a study by IBIS World predicts the craft beer market will grow to $3.9 billion this year. A few recent studies have shown a decline in beer consumption as wine and mixed drinks grow in popularity, but it’s the Big Suds breweries — Anheuser-Busch, MillerCoors — that seem to be losing favor in the market. That’s all good news, right? Local brewers feel confident, despite the inherent challenges. In the case of Red Yeti, Paul and Brandi Ronau ran into problems with the building at 256 Spring Street that delayed the opening. If and when it does open at the end of this month, head brewer Paul Ronau says the beer on tap will be guest crafts. Original beers probably won’t be ready until spring, but still they move forward. At Great Flood Brewing, much research was done to ensure a good chance of success. “We hope we’re not close to a saturation point,” says Cain. But how will they differentiate from other brewers around town or, heck, just down the street? Experimentation will be the order of the day. They are even tossing around ideas of ways to get customers involved in helping out with recipes. Leah Dienes, co-owner and head brewer at Apocalypse Brew Works, believes there is room in the market for more breweries. Bannerman will open just down the street in April, but she fully believes the two breweries can co-exist. Dienes keeps overhead down by operating a taproom that opens only on Friday and Saturday. Many of her sales come in the form of growlers, often to regulars who live in the neighborhood. Apocalypse also brings in food trucks every weekend and hosts special events, creating foot traffic. Poorcastle, a daylong concert series in July, and Yappy Hour, a Kentucky Humane Society benefit as part of Louisville Craft Beer Week, were two events that brought in big crowds in 2013. Speaking of Louisville Craft Beer Week, it’s also a positive sign that such events and efforts not only exist, but that they keep growing; there are more and more craft beer events popping up each year and enjoying success, from Brew at the Zoo to the Highlands Beer Festival to the forthcoming debut of Tailspin Ale Fest, set for Feb. 22 at Bowman Field. Louisville even has its own website dedicated to the local beer scene in LouisvilleBeer.com. But all that still doesn’t mean the market couldn’t top out. Dave Stacy, the head brewer at Gordon Biersch on Fourth Street, believes a saturation point is ahead. Still, if a customer comes to his place and can’t find a beer he likes, Stacy will direct that person to BBC, Apocalypse or Against the Grain. Will there come a time when there is too much of a good thing? It’s a good point. Why panic when the market is still growing? Stacy points out that differentiation is an important factor. Gordon Biersch specializes in German-style beers, and there is no other brewery in Louisville doing that specifically. If you want a Marzen-style beer, well, Gordon Biersch is a good place to look for one. At the same time, Blue Stallion opened last year in Lexington and also specializes in German lager-style beers. Sure, it’s a good 70 miles down the road, but it’s still down the road. How long before another brewer follows that lead? And for Gordon Biersch, there is also the specter of how beer snobs eschew chains. “Our challenge is how people view us,” he admits. Bubble in the beer market? Roger Baylor, owner of New Albanian Brewing Company, has been in the business of craft beer for quite a few years; his business model with Rich O’s Public House and Sportstime Pizza hinged on it from the word “go” when those side-by-side concepts launched in 1990. Later, he was the first one in town to eliminate sales of corporate beers like Bud Light. New Albanian as a craft brewing entity was founded in 2002. 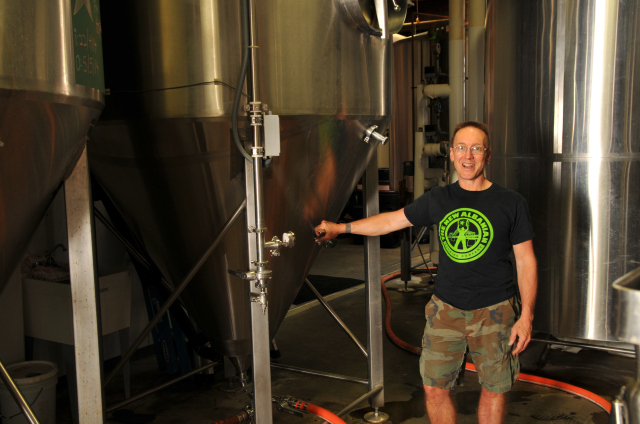 Pat Hagan has been in the craft-brewing business for more than 20 years as owner-operator of Bluegrass Brewing Company. BBC survived a 1990s market that claimed local breweries such as Pipkin and Silo, and also outlasted Ft. Mitchell-based Oldenburg. Hagan wonders aloud what the new brewers’ aspirations are. 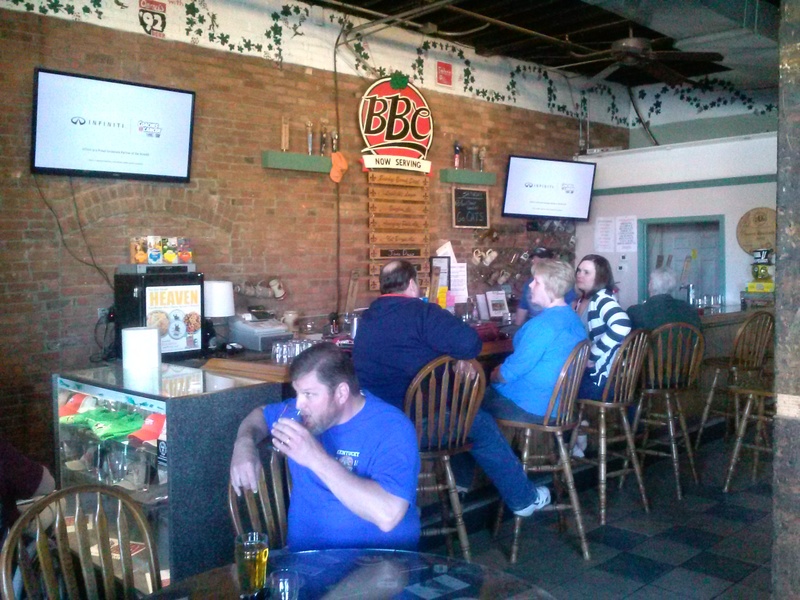 BBC, like NABC, bottles and distributes outside the Louisville market and has a presence in taps around the area. Breweries like Apocalypse can also be found tapped around town. But how big is too big? Like others, however, he’s simply happy the demand has become so big. That has created room for all these craft brewers’ aspirations and promises plenty of new beer in 2014 and beyond. “At least consumers are more aware of it and more willing to try it,” Hagan says. Cory Riley of Bannerman Brewing noted that Michigan Brewing Company entered Chapter 7 bankruptcy earlier this year; it is a mid-size craft brewery. A handful of other craft-brewing companies have suffered similar fates over the last year and a half. Is that evidence of saturation in that market, or are these isolated situations? Once again, differentiation may be key. Riley says he plans to feature sour beers and Belgian-style beers at Bannerman, which is different than a BBC, a Cumberland or a New Albanian. He also believes people who drink local craft beer will drill down in their support of local products. “You’ll find that people who live in certain neighborhoods will go to their local brewpub,” he says. Also, he points out that many will avoid drinking and driving by walking to their local brewery for beer. Of course, that notion takes us back to the days when distribution channels were smaller and refrigeration wasn’t as advanced as it is today. It wasn’t all that long ago that buying a six-pack of Corporate Light at the liquor store wasn’t even an option, so you went to the corner pub with a bucket and got it filled up with whatever was on tap. The return of the local brewer and the growler is obviously a good sign, both economically and socially. Baylor believes one of the keys may be to remain as local as possible. Five years ago, New Albanian began brewing beer for bottling and distribution outside the Louisville area. But he believes broader isn’t necessarily better. While that doesn’t mean NABC will stop bottling and distributing, what it does mean is a re-focus on maximizing what’s happening in-house, “and be even more ‘local’ than before,” Baylor says. Additionally, the local and regional craft brewers are still competing for that space with established brands like Sierra Nevada, New Belgium and even pseudo-craft beers like Blue Moon, he says, and at price points the smaller breweries can’t hope to match. All good questions, with unknown answers. Meanwhile, however, the beer boom is on, and how big the bubble can manage to get is still anyone’s guess. It sure isn’t going to stop those who believe the market has plenty of room to expand. This post was originally published in LEO Weekly.